As one of the premier neighborhood communities in Chandler Arizona, the Carino Estates subdivision enjoys many of the great amenties it holds. Carino Estates is a 721 home subdivision north of Queen Creek Road, between Arizona Avenue and Alma School Road in Chandler, Arizona. 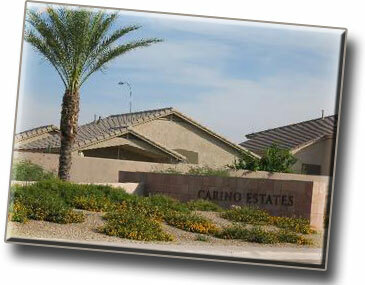 Carino Estates is just a few miles south of the 202 freeway and was originally developed by Shea Homes. Many of the shopping destinations close by include Target, Wal-Mart, Sam's Club and the Las Tiendas shopping center right at the corner of Alma School Rd & Queen Creek Rd.